Some days just call for pie. They really do. The morning was slightly overcast, and Mother Nature was starting to hint that fall is coming. So naturally with the grey clouds and cooler temperatures, I woke up craving pie. What, that’s never happened to you? Well, morning pie cravings happen to me more than I’d like to admit, but rarely do I give in to them. This time, however, I couldn’t resist. It was just one of those days that called for pie. I wanted the comfort of flaky crust, sweet berries, and fluffy whipped cream paired with a warm cup of coffee while I curled up in my reading chair. Now you see where I’m going with this. Sounds pretty good, right? I know. That’s why I made pie. You may have heard of berry pie or even a triple berry pie, but get ready, this pie has ALL the berries in it. Okay, not literally all of them, but it does have four different types: strawberries, raspberries, blueberries, and blackberries. It’s like one big berry dance party in your mouth. And for the crust, oh man, this recipe delivers 100% flaky, buttery, golden goodness. I’m a pretty harsh critic when it comes to crust, but will definitely bookmark this to use for future pie endeavors. Finally, top your pie with homemade whipped cream and voila, pie perfection. Enjoy! Begin by preparing your pie dough at least 1 hour before you plan on baking your pie; the dough needs time to chill. You can find step by step instructions here at Sally’s Baking Addiction. After the dough has chilled for nearly an hour, you can prepare the filling. To make the berry filling, first mix sugar and cornstarch together in a medium bowl; set aside 1 tablespoon of this mixture (it will later be sprinkled on the pie dough). Next, add in berries and cinnamon then stir until well combined. Let the berry mixture sit for 10-15 minutes. 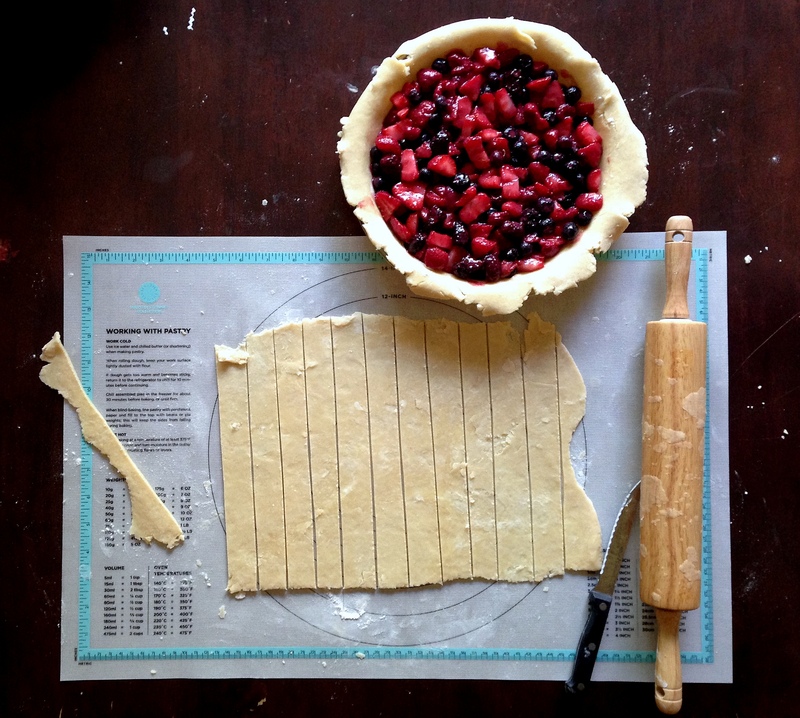 While the berry mixture rests, preheat the oven to 375ºF and then roll out your pie dough. Remove one of the dough disks from the fridge and, on a lightly floured surface, roll out the dough to form a 12-inch circle (mine was a little closer to 14-inches; just make sure the rolled dough will cover the bottom and sides of the pan. You will want a little bit of excess hanging over the sides which will be helpful when connecting the lattice pieces). To easily transfer the dough to the bottom of the pie pan, roll the dough around the rolling pin and then unroll into the pie pan. Once transferred, gently press the dough into the corners of the pan. Next sprinkle the remaining tablespoon of cornstarch and sugar on top of the rolled out dough; this will help prevent the bottom of the pie from becoming soggy. Next pour berry filling into pie pan. Finish your pie by rolling out the second dough disk into a 12-14 inch circle and then cut into 1 inch strips to be used as the lattice. For further detailed instructions on preparing your lattice top, you can check out this overview. Once you’ve finished your lattice, brush the dough with egg and then sprinkle with granulated sugar. Bake for 20-30 minutes until edges are golden brown, then cover edges with foil and continue baking for an additional 20-30 minutes until the center is bubbly and has thickened. To make the whipped cream, add the heavy whipping cream to a chilled mixing bowl. Whip on medium-high speed until stiff peaks are about to form then add in sugar and vanilla. Continue to beat until stiff peaks form; be careful not to over-whip or the cream will become too thick and lumpy.